Tenochtitlán was the capital city of the Aztec empire, occupying what is now the centre of Mexico city, in what we know as the Valley of Mexico. At the time of the Spanish invasion in 1521 it has been estimated that its population numbered over 200,000, making it one of the largest cities in the world at the time. 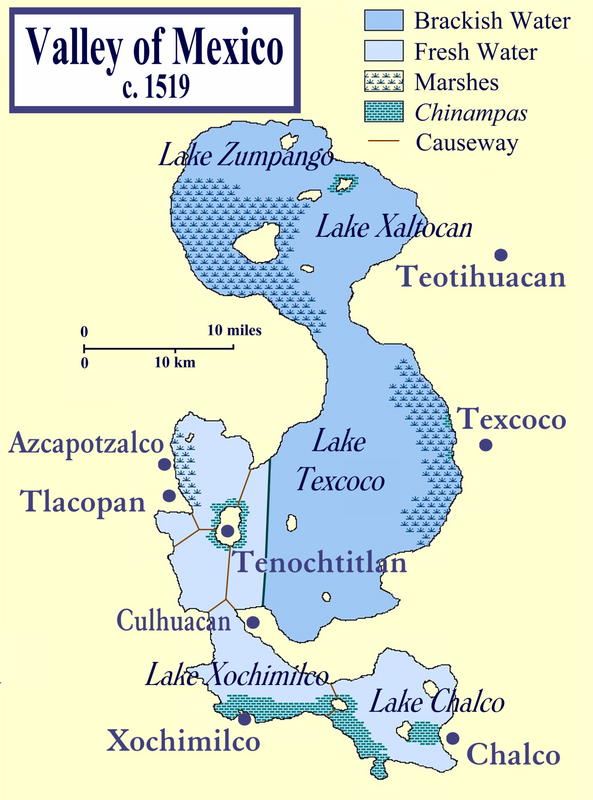 It was built on an island in the middle of a lake(a), a feature often found with many ancient Aztec towns and cities. The features of Tenochtitlán have been frequently compared with Venice and its canal system, not to mention the concentric waterways of Atlantis described by Plato. Like Atlantis, it too has its central pyramidal temples as well as bridges and other structures. 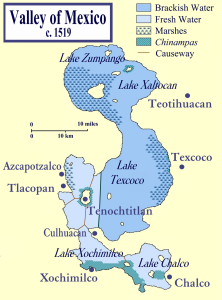 Edward Ziomek continues to promote the idea of a Mexican Atlantis centred on Tenochtitlán(b) and/or Teotihuacan(c).